Happy Floors is pleased to be a nationwide distributor of porcelain tile, which is considered green within the industry. It is very important to first identify what attributes make tile eco-friendly or Green. In general ceramic / porcelain tiles are inherently green because they do not contain VOC's (Volatile Organic Compounds), are low maintenance, and have a long life cycle. The Italian tile industry is known as the world leader in design and technology. Italian tile manufactures also are very environmentally conscious and take multiple steps to reduce their carbon footprint. 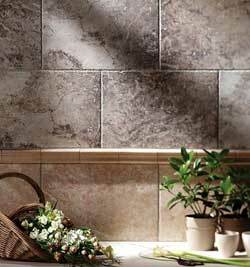 In general majority of Italian tiles contain recycled materials. The amount of impact on the environment will vary from factory to factory and tile to tile. Manufactures may have their products tested in order to determine the amount of pre & post consumer recycled material found in each tile. The amount of recycled content can vary greatly from light to dark colors within one type of tile series. The Happy Floors porcelain tile collection is 95% Italian made. Architects have taken the green movement to the next level by requiring that tile products be certified in order to be used for certain projects. The ultimate goal is for a project to receive an eco-friendly status. The US Green Buildings Council (USGBC) is one organization that helps set guidelines for building green. The USGBC has established LEED (Leadership in Energy and Environmental Design) as a reference guide. "LEED certification provides independent, third-party verification that a building project meets the highest green building and performance measures. All certified projects receive a LEED plaque, which is the nationally recognized symbol demonstrating that a building is environmentally responsible, profitable and a healthy place to live and work." www.usgbc.org. It is important to note that individual tile products can not be LEED certified but that tile ultimately helps a finished building earn LEED points. Happy Floors is a USGBC member and offers certified products to help projects earn LEED points.